There are a number of models in the Acer Predator range so you’d be forgiven for getting confused. The Acer XB270H has a TN based panel and Nvidia’s G-Sync version adaptive sync technology. 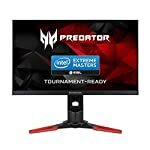 There is also an IPS based version of this monitor, the Acer XB270HU, and just to make things really complicated, if you have an AMD graphics card you’ll want to be looking at the FreeSync versions of these monitors, for example the Acer XF270HU. Personally I would go for an IPS panel, they typically have better colour accuracy and wider viewing angles. The TN based monitors do have fast response times but the IPS screens in this range are built for gaming and give a beautiful clear image. Of course TN panels tend to be cheaper so you may have a different priority but that’s my 2 pennies worth! So what else do you get with the XB270H? 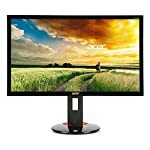 This is a 27″ screen with a 1440p resolution, currently a very popular combination and one which many agree is a sweet spot for QHD. 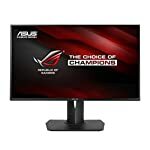 With a 144hz refresh rate this is clearly a gaming monitor built with fast paced action games in mind. And of course G-Sync, which tends to put the price up when compared to a FreeSync equivalent. The XB270H isn’t the most attractive monitor out there. The plain black bezel is not the thinnest and the stand is very ordinary, but that said, there is nothing really wrong with it either. If you don’t judge a monitor on looks, like most of us I expect, this shouldn’t really put you off. Connectivity is well catered for, you get a DisplayPort 1.2, HDMI 1.4, DVI and D-SUB inputs, two audio jacks and four USB 3.0 ports. The stand has a full range of adjustments, you can tilt, pivot and even swing into portrait mode if you really wanted run to the latest version of Doom in such a manner! Speakers are included but as usual they lack the oomph to make them worthwhile in gaming. Stick to the included headphone socket if I were you. The XB270H was a ground breaking monitor being the first 27″ screen with 144hz refresh and G-Sync all bundled in the same package. 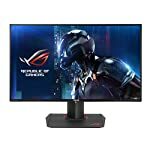 This monitor now has much more competition thanks to a whole range of G-Sync screens and of course the competing, cheaper, FreeSync technology. To benefit from such a setup you need to be playing fast paced action games. If your preference is for turn based strategy then this type of spec is most likely overkill. You’ll also need a beefy video card to output 144 frames per second entry level cards are going to struggle I’m afraid. On the upside, if you have a compatible Nvidia graphics card, G-Sync will help keep things running smoothly if your frame rate does drop. All this does add to the cost however. The Acer uses a TN panel with an LED backlight, these panels benefit from fast response times and bright images but can be held back by poor viewing angles and less vibrant colours. It does help keep the price down though. We give the Acer XB270H a 4 out of 5 rating. Want to know what existing owners of the monitor think? You can read real user reviews here. 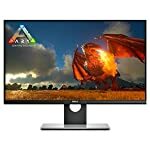 Should I buy the Acer XB270H? The combination of G-Sync and 144hz refresh rate makes the Acer XB270H a super fast super smooth screen aimed squarely at the gaming market. A good range of ergonomic adjustments and a decent enough picture quality all go in its favour. If you are having some doubts about this purchase then why not read some real owner reviews and see what other buyers think.